First and foremost this is not a quick job and it requires lots of patience. It is unlikely that it could be completed over a weekend -unless you are lucky. Be prepared and plan what tools you will require to complete the job. Set achievable and realistic objectives for the day and do not rush it to catch up if you fall behind. I consider any stage after the removal of the turbo as a ‘one way street’ as you become committed to succeed or fail. 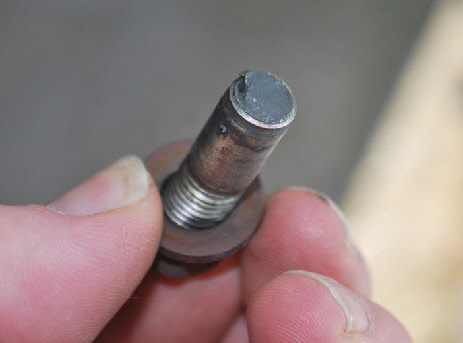 This only covers the removal and replacement of the broken studs from the cylinder head. 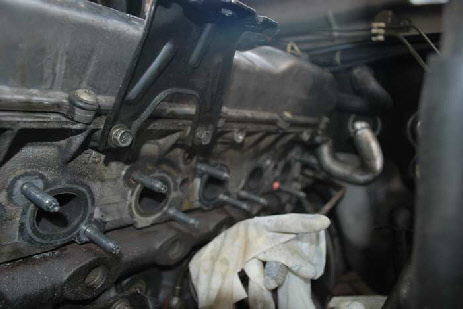 If you would rather pull the engine out completely, you can follow this guide on Skyline Engine Removal Procedure Step by Step. Cobalt HSS drills 2mm & 3mmm. Stud extractor ( 10mm ). Electric drill with reverse and adjustable clutch. Mirror - dentist style and large. Punch centring aid ( home made ). Cobalt drill and Easy Out Set..
24 oz Soft face mallet. 4 Turbo water cooling copper washers. 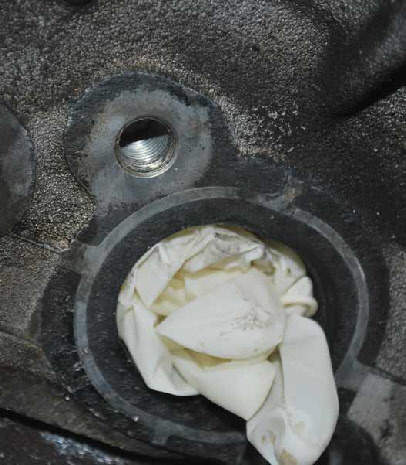 Remove Exhaust manifold as described in the R33 Workshop Manual on pages 135 / 6. The inboard water cooling banjo connection on the turbo is 24mm and was very difficult to access and extremely tight. Using ‘freeze and release’ undo as many manifold nuts as possible. I managed to get off seven , the remaining five were broken just below the surface of the head ( the front three and the rear two ). Spray the remaining good studs with ‘freeze and release’ and using the 10mm stud remover remove the studs. The first thing to do was to center punch the center of the broken stud. To assist the centering I made an aid from acrylic for the automatic center punch . These studs are made from a very hard steel and took the point off of the center punch - it required re-grinding twice. It is essential to get this bit right - I would suggest checking and re-checking the center punch mark is central on the broken stud. I reinforced the automatic punch mark by using a traditional center punch and hammer. The most difficult one to do is the rear one. With the studs punched it is now possible to start drilling. I used cobalt drills and used a new one every two studs. I started by drilling with a 2mm drill driven from a right angle drill attachment attached to a reversible variable speed battery powered drill fitted with a torque clutch drive. I drilled in to the stud approximately 2 - 3mm then changed to a 3mm cobalt drill and continued drilling. It was possible to check the center accuracy of the drilling by using a mirror and a torch to illuminate the area. In my case one side effect of changing from the 2mm drill to a 3mm drill was to loosen the stud and drive it further in to the head. 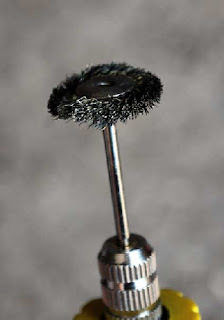 At this stage I would suggest using a small rotary brass wire brush to clean the top of the thread as it is most likely contaminated with exhaust carbon which will make it harder to extract. The stud can be driven to the top of the thread by using the left twist drills - do not forget to reverse the direction of the drill when using these drills . The left twist drills were only HSS and became dull very quickly but they did force the stud to the top of the thread where it stayed and allowed completion of the drilling to a depth of approximately 6 - 7 mm by using the 3mm cobalt drill. This depth was required to ensure that the cobalt easy out did not bottom out on the hole as it was turned. I drilled and removed the broken studs one at a time. Where possible use a tap wrench to insert the easy out into the drilled hole of the stud as this gives good tactile feedback when unscrewing the stud. Use freeze and release on the stud to be removed with the easy out inserted and tightened ready for turning. Slowly turn the easy out and eventually the stud starts to turn -STOP - more freeze and release - wait 20 seconds and start turning again after approximately one complete turn stop and apply some more freeze and release. 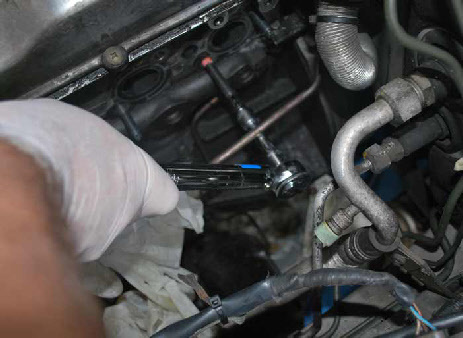 Continue turning the tap wrench and the stud will become free and easy to turn and can be screwed out. 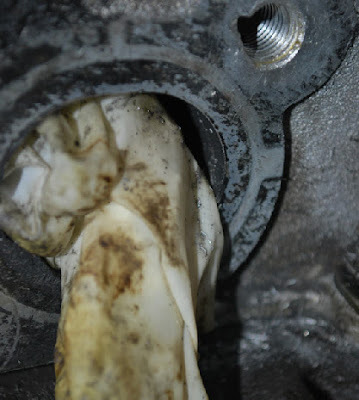 I think the reason for the initial tight start is due to the damage on the leading part of the thread where the stud sheared - all of mine were distorted at the point of fracture and would cause the thread to become tight when turned. Repeat for the remaining broken studs. The only difference was with the rear stud where it was not possible to use the tap wrench due to lack of space. I resorted to using mole grips to grip the easy out - this is risky you have far less control over maintaining the square angle of the easy out which could cause the easy out to break. If this method is used take your time and do not rush it. Before fitting the new studs I would suggest removing any remains of the old exhaust gasket and carbon which remain on the side of the cylinder head around the exhaust ports. I used a home made soft aluminium scrapper to do this and cleaned with WD40. The new studs were easy to fit as none of the threads were damaged. Good luck - just be patient and take you time. If you pulled your engine out, you can follow this guide, Step by Step Skyline GTR Engine Re-installation. Dealing with these studs is quite a pain, but it's so essential. Good luck! PS - send us some photos of the work you do, we're happy to share!